Many animals rely on information from vocal signals to assess potential competitors and mates. For example, in primates, males use loud calls to assess rivals when the acoustic properties of the calls reliably indicate the condition or quality of the sender. Here, we investigate whether the loud calls of male geladas (Theropithecus gelada) function as a quality signal. Gelada males produce loud calls during ritualistic chases with rival males. Given the physically taxing nature of these displays, we hypothesize that variation in the acoustic properties of loud calls reliably signal male stamina or competitive ability. To test this hypothesis, we examined whether the acoustic properties of the gelada loud call varied in relation to individual, age, status, and exhaustion. Specifically, we examined 12 call parameters (e.g., fundamental frequency) and 3 bout parameters (e.g., number of calls per bout), that have been previously shown to vary across condition in male primates. 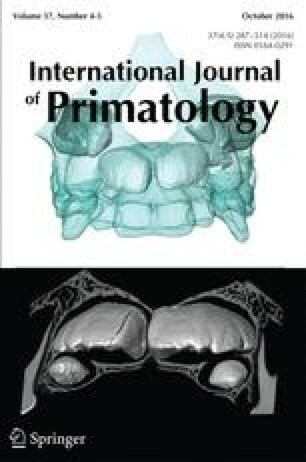 We found that several acoustic features varied consistently across age and status such that males deemed higher quality in gelada society (e.g., high status) produced more calls per bout, produced calls that were lower in overall frequency measures, and exhibited a greater vocal range. In addition, we found that similar acoustic features varied with exhaustion; after a long chase event, males produced both fewer calls per bout and calls with higher spectral measures. Results from this study are consistent with the hypothesis that gelada loud calls are quality signals, contributing to the growing evidence that primates may use acoustic information to assess the quality of a rival or a potential mate. The online version of this article (doi: 10.1007/s10764-016-9922-0) contains supplementary material, which is available to authorized users. We thank the Ethiopian Wildlife Conservation Authority (EWCA) as well as the wardens and staff of the Simien Mountain National Park for permission and support in conduction research on geladas. We are extremely grateful to M. Gomery for her assistance recording vocalizations, R. Mundry for statistical advice, and K. Hammerschmidt for help with acoustic analysis and software. We also thank all the members of the University of Michigan Gelada Research Project for assistance in data collection and valuable insight on analyses and interpretation. Many thanks go to the editors J. Setchell and J. Higham, as well as to C. Neumann and an anonymous reviewer for insightful comments that greatly improved the manuscript. This project was funded by the National Science Foundation (IOS-1255974, BCS-0715179, BCS-1231790), the NSF Graduate Research Fellowship Program, the Leakey Foundation, and the University of Michigan. Bates, D., Maechler, M., Bolker, B., Walker, S., Christensen, R. H. B., et al. (2015). Package lme4. (http://lme4.r-forge.r-project.org/).